Michigan’s housing market was hit hard during the United State financial crisis in 2007. It became difficult for many homeowners to afford their monthly payments and were ineligible for refinancing. As the economy has turned around, so has the outlook on the market. The Federal Reserve sets the interest rates associated with mortgage rates in Michigan (MI), and nationally. And economic factors dictate the overall housing market health. Below, we’ve detailed current mortgage rates in Michigan, a handful of mortgage companies in Michigan, and the overall forecast of mortgage rates and housing trends. According to Zillow, the median home value across Michigan took a deep plunge during the United States recession. In 2012, the median home value in Michigan was $88,900. Zillow’s forecast predicts that in 2018, home values will continue to rebound significantly, to a median home value of $135,000. As of April, 2017, median home values are set around $132,000. As market value rises, so are interest rates. The Mortgage Bankers Association predicts interest on a 30-year fixed rate mortgage to average 4.7 percent by the fourth quarter of 2017. The National Association of Realtors has a similar prediction. The NAR anticipates 30-year mortgage rates to average 4.6 percent interest by the end of 2017. These two forecasts can outline specific refinance timelines for borrowers. Depending on the interest rate you secured on your initial loan, and your current monthly payments, you could qualify for substantial savings. Interest rates pre-2009 were often as high at 8 percent. Home prices aren’t set to increase or decrease drastically in the projected future, however interest rates are beginning to rise. This means, if refinancing in Michigan is on your agenda, consider making a move sooner rather than later. In order to make an informed decision about whether refinancing makes good dollar sense, the best place to start is with local banks. Homeowners should determine whether the 30-year refinance rates in Michigan are lower than a homeowner’s current rate. As a rule of thumb, borrowers should consider interest rates one percent (or more) lower than your current rate. This rate difference should mean savings for the borrower. 15-year mortgage rates in Michigan are at an all-time low, and this type of loan is also one of the best products to use for a refinance. Borrowers might have a slightly higher monthly payment, but the rapid payoff schedule and low interest allow borrowers to become debt-free in a shortened period of time. As with everything in the mortgage industry, the best product will vary case by case. You may need to answer a few questions about your refinancing goals before determining which product is right for you. For homeowners who are current with their existing mortgage but are interested in realizing significant savings with the lowest refinance mortgage rates in Michigan, a variety of options are available. Because staying current with mortgage payments produces a better credit score, they will have earned the best eligibility for a new, money-saving loan. They will have the most bargaining power in hammering out terms of the refinance as well, such as negotiating a low-cost or no-cost refinance. Also, paying your mortgage regularly often results in more equity. Michigan homeowners with over 10 percent equity in their property can be eligible for a cash-out loan, in which they refinance for a greater amount than they owe in order to receive the difference in cash, to use as they wish. A home equity loan, technically a second mortgage rather than a refinance, may also be an option for withdrawing cash from a property investment that the savvy homeowner in Michigan could use to make improvements that will add value to the residence and benefit the family’s comfort as well. The cost of refinancing isn’t only about your monthly payments of life of loan cost. The amount of fees a borrower is liable for at closing should also be considered. Some of these fees may include: escrow, settlement fees, title insurance, and underwriter fees. Some loan companies offer a “no-cost” option which helps borrowers with limited finances get a new loan. No-cost refinancing loans can also mean no appraisal fees – which can cost around $400. If you are required to pay some of these ancillary fees, see what you can do about paying the closing costs up front instead of bundling them into your loan. Upfront payment of fees can save money in the long rate and eliminate the risk of being charge a higher rate by your lender. Whether an existing loan is FHA, VA, Fannie Mae, Freddie Mac, or another type, to get the very best refinance mortgage rates in Michigan, homeowners should first check with their current lenders. As existing customers, you may be able to negotiate a better package with lower fees as opposed to starting fresh with an unfamiliar lender. 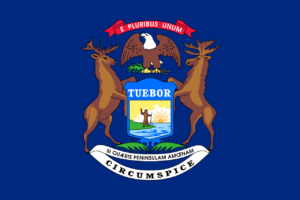 If the existing mortgage is at risk of foreclosure, Michigan borrowers should contact the Michigan State Housing Development Authority for information on government refinancing programs. A mortgage broker could be another great resource to secure low rates. Brokers have connections to many lenders and can handle the research portion of refinancing for you. Be aware that brokers charge a fee for assisting your search, make sure this fee makes sense for you. There are advantages to using a community bank or credit unions too. Credit unions often have lower fees rates on programs like refinancing products. Credit unions that service Michigan are: Lake Michigan Credit Union, Community Choice Credit Union, and Genisys Credit Union to name a few. Using a mortgage calculator is a surefire way to see if refinancing makes sense for you. You can also use a calculator to compare your current monthly payments and life of loan cost to various refinance options.